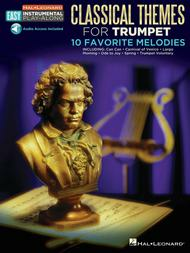 Trumpet Easy Instrumental Play-Along Book with Online Audio Tracks. Composed by Various. Easy Instrumental Play-Along. Classical. Softcover Audio Online. 8 pages. Published by Hal Leonard (HL.123112). ISBN 1480360511. 9x12 inches. Book with Online Audio Tracks.